(CBS News) If it's the afternoon on a day that begins with the letter "F", then it can mean only one thing: it's time for The Feed's Friday Music Round-Up! This week we decided to focus on our friends "across the pond" with a few British musical items that caught our eye and ear. So we start this very special British edition with Mr.B The Gentleman Rhymer and his music video for the song "Just Like A Chap" directed by Rob Bradley above. Go ahead and take a look and listen. And I couldn't call it a British edition if I didn't have at least two items hailing from Great Britain in it, could I? So we turn now to a song that attempts to define exactly what it means to be British in the form of some tongue-in-cheek, lyrical rap and rhymes from Professor Elemental. 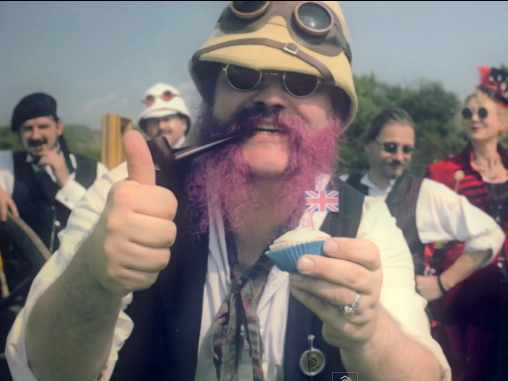 Check out his music video for the song "I'm British" directed by Moog Gravett below. And we always try to highlight some lesser-known musicians out there on the Internet here on our Friday Music Round-Up. This week we really enjoyed this Ke$ha cover below of "Die Young" performed by Jake Coco and Jess Moskaluke. Take a listen and I think you'll probably enjoy it, too. Our creative clip this week is a fascinating music video created by Vimeo user northamerican while he was a student studying graphic design at Dawson College in Montreal. The piece is aptly entitled "desktop orchestra" and is a total trip of both sight and sound. Check it out below. Our final item in the Friday Music Round-Up tends to be something a bit different from the norm. This week I went with a trip down memory lane in the form of a rendition of the "Adventures of the Gummi Bears" cartoon theme song performed by Alicia Keys recently on "Late Night with Jimmy Fallon". Get ready to feel the childhood, Saturday cartoon nostalgia wash over you! With that, I hope everyone enjoyed this week's round-up and has an amazing upcoming weekend. And make sure to keep coming back to The Feed for all of your viral (and music) video needs!